Everyone loves having a clean house, but having kids and pets can make it hard to keep up as often as you would like. But don’t worry! With knowledge and lots of experience, we have put together some great basic tips to keep your house clean on a day to day basis. You should enforce that your house is a no shoe zone. When you get home from work or wherever outside, have your family take their shoes off right away before entering the house and put them on a shoe rack or inside your coat closet. This keeps from germs and other things that you don’t want being tracked in your house, and keeps dirt in one place. Same thing with coats, when you get home and take your coat off, hang it up in your coat closet instead of on the back of your kitchen chair. Growing up my mom was so against me leaving dirty dishes in the sink, especially when there was plenty of room in the dishwasher. It’s so easy to rinse, open the door and stick in the dish inside the dishwasher. Run the dishwasher at the end of night, and in the morning you’ll have clean dishes that will take you a few minutes to put away. After you use pots and pans, clean them immediately, dry and put away. You’re counters will look clean and organized and you’ll have what you need the next time you cook and you will have clean dishes ready for you to use. When you use anything weather it be craft supplies, tools, or as little as a pair of good scissors, don’t leave things out or to put them somewhere where it didn’t belong, you’llnever be able to find anything. 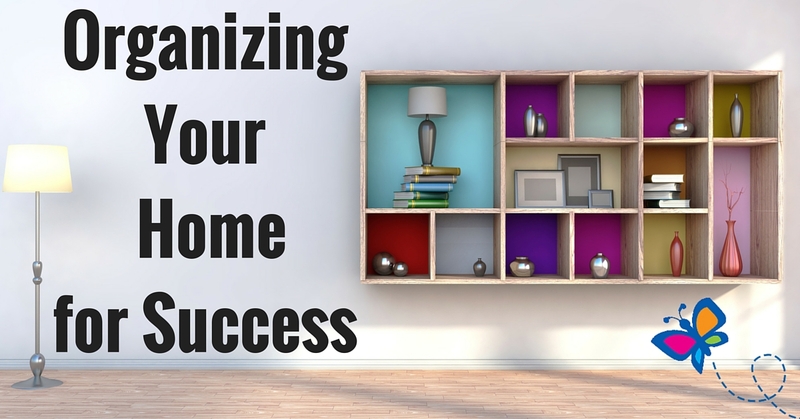 Putting things back where you’ve determined they live in your home ensures everyone knows were to find things and keep your house neat and tidy. I dust once a week. If you dust and vacuum weekly, your house will remain cleaner and you’ll save time because you won’t have to do a major cleaning each time you do decide to clean. Things will stay presentable longer. Also sweeping and moping your hard surfaces once a week ensures that your house will become easier to clean. Keeping busy surfaces wiped clean. On a day to day basis there are certain surfaces that should always be getting wiped. If you have to go track down paper towels and special cleaner, you may get distracted or never make it back to the bathroom. I have a vinegar/water/lavender oil mix in a bottle under my bathroom sink, so when I’m in there already I just give it a quick spritz and wipe-down with a bit of toilet paper and then flush the paper. That way it never gets really nasty, even when I go weeks without doing a “big” clean. I do the same thing for kitchen surfaces. I am really ruthless about getting rid of “stuff” or not allowing it in the house to begin with. Daily I gather up any papers that are laying about or mail that doesn’t seem to have a home and take care of it. I recycle paperwork I never use, or haven’t had a use for in years. Keeping areas like counter tops, dining tables, and tables that are used for entertaining, such as in the living room decluttered of papers goes a long way. File the important papers and recycle/shred the ones that need to go! Focusing on these things regularly can drastically improve the cleanliness of your house. If you have pets, vacuuming every other day is best. If you have more than one kid, keeping toys organized, picked up off the floor, and in one place in each room will become easier when it is time to clean up. Getting rid of things is always fun. Clothing and toys that your kids have grown out of, give to someone or somewhere that will love to have them! If you know you have good stuff that can be used again and is in great condition, get some money for it and have a garage sale! Out with the old (especially things that go years un-touched and have no hope) and in with lesser and newer! Having a clutter free- clean house makes you less stressed and is very important in keeping a healthy house. I understand it can be a hassle keeping up with everything, but I love having a clean home! If you can’t stay on top of these tasks yourself, you can always hire a professionals house cleaning service. This is always a good option for people that simply don’t have enough time. After all, TIME IS MONEY!